At TryMunity, it’s our top priority to provide resources, information, and support when it comes to traumatic brain injury prevention. We know how challenging it can be when a loved one, especially a child, has suffered a brain injury—it has an impact on everyone who is involved in the life of the victim. Even harder to imagine, the road to recovery can be long and difficult. In some cases, a life may be permanently changed. Much coverage has been given to new reports linking contact sports and traumatic brain injuries. 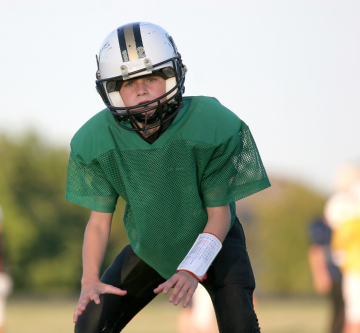 While sports are fun ways to kids to exercise, learn life skills, and socialize with others, the prevalence of concussions make them dangerous. Below, we explore some ways you can protect your sports-loving children from life-changing brain damage. Brain injuries in sports are common and of great concern. On a national level, the NFL and other contact sports are making changes to ensure fewer brain injuries occur. One of the most notable incidents of a brain injury making an impact on the world of sports was the death of Dale Earnhardt Sr. As a result of his tragic accident that involved brain trauma, all drivers were required to wear helmets with a full face shield and neck restraints to reduce the chance of severe injuries. Racing courses were also designed with more protection. Families can take measures at home to protect their children. Having the proper head gear is a must, no matter the sport. Helmets should be of good quality and fit correctly. Helmets should be worn during contact sports, while riding a bike, while rollerskating or skateboarding, and when skiing. While other types of padding are always recommended, the brain and head should always be emphasized. In any instance of a head injury, no matter how small, treatment should be immediate. When there is any doubt, it’s best to call the doctor or head to the emergency room. This plan of action applies to injuries at home, school, or during a sporting event. If your child experiences any of these symptoms after a blow to the head, seek medical attention immediately. It’s always better to be safe than sorry in these situations. Family members must find their way in dealing with the consequences of a traumatic brain injury, assisting an individual in overcoming day-to-day obstacles. New coping skills may be necessary with the care and support of an entire household. Take advantage of the valuable resources that are available to you at TryMunity. Sign up for your membership today and start enjoying our support services, helpful blogs, and inspirational stories. Let’s work together to deal with brain trauma and prevent it!